Anyone else remember this book? 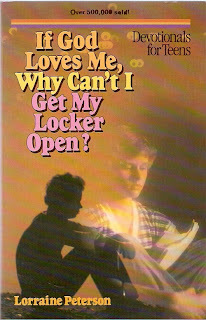 I didn’t read it, maybe because I never had trouble getting my locker open. I’m guessing that sweet 70’s era book might have a good answer for me, so now I’m kicking myself for not pulling it off the church library shelf, but I have a pretty good idea what it would say. 1. Our stuff did not fall in the ocean. 2. We are not like those people we met who shipped their stuff to the US and didn’t get it for a year (Oh Lord, please don’t let us become those people). 5. We have things to ship. Lots of things. A lot of people don’t have anything. 6. This is a light and momentary trial, especially compared to what so many are going through. 7. It’s kept us on our knees. 8. God is still God, and He is still good. It’s this last one that I wrestle with in times like this, and I think that’s good. It’s good because it makes me think about what goodness to us really is – not our comfort or our happiness, but something much bigger and better. It’s good because it reminds me that God is not our vending machine, our Santa Claus, our butler, who does what we ask. when we ask. It’s good because it puts me in my place, a place of being very small and insignificant, which is why the fact that He loves me still is even greater. I think I know what to do if I can’t get my locker open. I hope our belongings are on a bigger boat than this one. Amen. It's good to work at getting a higher perspective.